U.S. stocks continued to post new milestones and record highs last week, with the S&P 500 and Dow Industrials posting their sixth consecutive weekly gain. Friday marked the 24th time this year that all three major U.S. equity indices simultaneously closed at all-time highs, and the S&P 500 and Dow Industrials posted record closing highs every day last week, a feat last seen in 1998. The NASDAQ Composite recorded its third all-time high during the week and its fourth straight positive week. The main catalysts moving stocks higher last week were stronger-than-expected corporate earnings and the Senate’s passage of a budget framework for 2018, which is viewed as a precursor for eventual tax reform. For the week, the S&P 500 rose +0.88%, the Dow Industrials gained +2%, closing above 23,000 for the first time on Wednesday, and the MSCI EAFE (developed international) decreased by -0.31%. The U.S. Census Bureau reported that housing starts were lower in September, at a 1.127 million seasonally-adjusted annual rate, lower than last month's 1.183 million. In our view, this reading is not indicative of weakness, but rather the effect of the three hurricanes that slowed down construction activity. 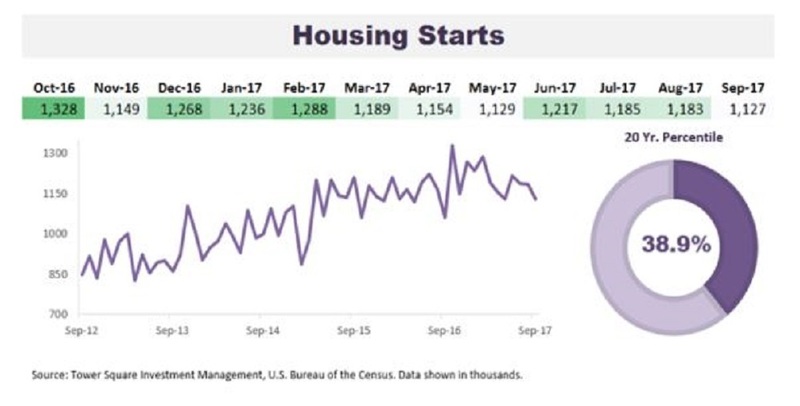 We expect there may be a near-term rebound in housing starts as conditions return to normal and rebuilding in hurricane-affected areas begins. Housing starts also were 6.1% above last year's September reading, and their three-month moving average, which smooths out month-to-month fluctuations, is 1.5% higher than a year before, both suggesting a solid positive trend. We should also note that, by historical standards, this level of activity is not elevated. Additionally, as Chart 1 illustrates, the current housing starts pace is at 38.9% of the average reading for the past 20 years, suggesting there is room for the sector to grow without overheating. In comparison, new housing starts averaged 1.79 million/year for the 2002-2007 period, but only 0.88 million/year since, despite population growth.